If you are not satisfied with standard geophysical methods, then you need something more! 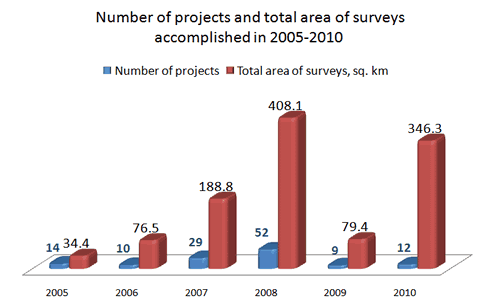 Since 2005 to 2010 JSC “Gradient” completed 126 projects with total area of 1133.5 sq. km. 95 wells were drilled by the Low-Frequency Seismic Sounding interpretation results. 81 wells have confirmed the forecasting. 28 wells produced hydrocarbons from the carbonate reservoirs, and 35 wells produced hydrocarbons from the terrigenous reservoirs.